Five ringers present, though Carroll did not ring: Anne, Carroll, Jody, Nancy, Thomas. The question was raised: is raising a matter of strength, or of knack, or of both? I think it’s primarily knack, since strength without knack gets you nowhere but one sees small ringers raising bells with no apparent effort. Anne raised and lowered several bells several times. Jody raised and lowered several bells. Nancy raised and lowered, and worked on ringing form: right hand on left at the bottom of the handstroke! Lowered the bells in no particular pattern. The dimensions of the planned rain awning are more exactly known now. Since the awning will be suspended above the bells, well above the height at which the walls are vertical and measurements can be taken directly, it has taken some time and experiment to determine the shape and dimensions of the space it will occupy and the awning itself. The ropes that will reinforce the edges and the long diagonal of the awning have been rigged into their planned dimensions and hoisted up to their eventual location, and this has helped determine the size of the space and the size of the awning to cover it. It appears that the awning should occupy a space 122″ square. This should cover the area through which water is dripping. 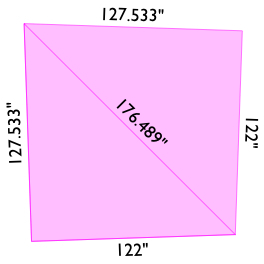 This square begins about 64″ above the ledge, or 144″ (12′) above the ringing chamber floor. However the awning itself will not be square. To direct water down off the awning, it will be lofted with three corners 64″ above the ledge and the fourth, on the north-west, 16″ above the ledge, resulting in a shape with a diagonal crease from SE to NW. As a result, its two horizontal sides will be 122″ long and its slanting sides will be about 127½” long. 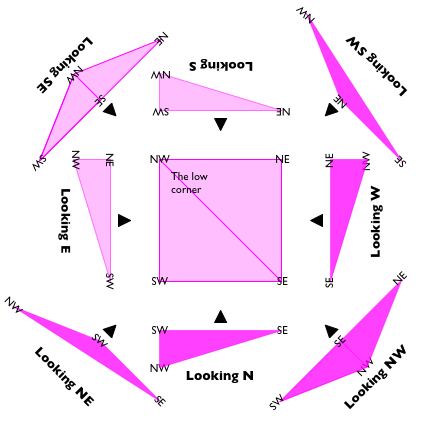 None of its corners will be right angles. 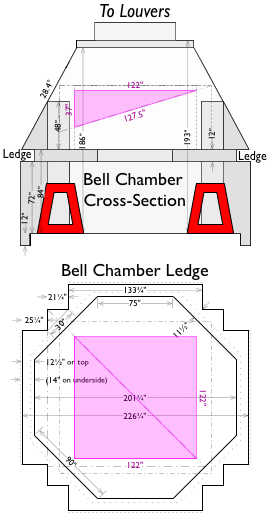 The bottom diagram shows views of the awning from eight directions, at awning height (it would be very difficult to actually get to that viewpoint in the bell chamber). The top of the awning is shown light-colored, the bottom dark-colored. Six ringers: Barbara, Eoin, Jody, Judy, Marguerite, Thomas. Rounds on 234567, then 123456. Whole Pulls on 123456: pull off, handstroke, backstroke, stand. Barbara and Eoin alternated on the 5 and 6. Many of the whole pulls were quite good, and the last one was just about perfect and everyone stood immediately. Plain Hunt on Four with two covers. Barbara and Eoin alternated on the 5 and 6, and the rest of the band rotated around on the front four. Barbara and Eoin raised the 1, 3, 4, 5, 6, and 7, and worked on ringing the heavy bells. Left wrist angled to align the grip on sally or rope vertically, or left fingers adjusted to accomplish the same goal. All ten fingers around the sally. The tail always on the ringer’s side of the sally. Fast follow-through after the release, both hands. Hands stay in the plane of the rope. Right hand on left for the pickup. Wrists stay aligned in the plane of the rope. No wrist twist or sideways hand movement during the follow-through, so that the loop of rope does not swing out to one side and then the other. Vertical motion, no throwing out; rotate the wrists at whatever speed keeps the flow of the rope vertical above the hands and bellying out below the hands. While this is a long list, they are interrelated so that making just a few basic improvements will wrap up all of them. Carroll raised and lowered the 2 to the first coil. Next class for Carroll and Nancy is Th 31 May. Four ringers: Jim, Jody, Judy, Marguerite. Marguerite ran the ringing. A potential new ringer, Melanie, visited. Four ringers: Barbara, Eoin, Nancy, Thomas. Rang up. Barbara raised two bells. Whole Pulls (pull off, ring two blows, stand). Some of them were quite good, in terms of even striking and immediate standing. Rang down. Nancy lowered two bells.